Russell Westbrook vs. Patrick Beverly – When Oklahoma City fans look at Beverly, we see the franchise’s mortality in the balance, at least for this core group of players (Durant, Westbrook, Ibaka, Perkins, Sefolosha, Collison). Everything was going great for the first 5 seasons in OKC (steady progression, draft picks working out, player development, and, most importantly, health). But that all came crashing down on April 25, 2013, when Westbrook had to go under the knife for a meniscus tear suffered the night before. The tear, caused by Beverly’s reckless attempt at stealing the ball as Westbrook was calling for a routine ‘across the timeline’ timeout, caused the Thunder, who were considered to be title contenders, to flame out in the 2nd round of the playoffs. This will be the first meeting between Westbrook and Beverly since the knee injury in last season’s playoffs. I would not expect any retaliation from Westbrook, as he has stated time and time again that he has no issues with Beverly personally. 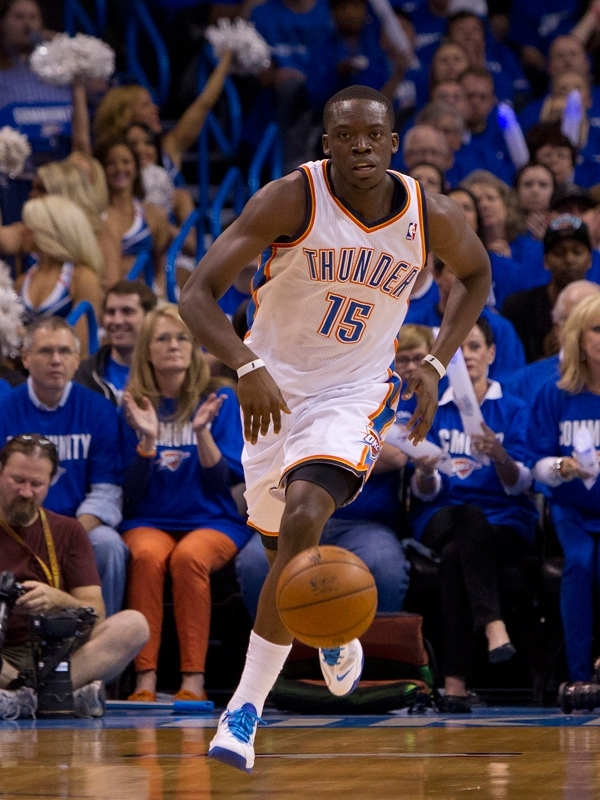 But OKC fans remember, everytime they see Beverly, that this is the man that not only crashed into Westbrook’s knee, but also, possibly, crashed into the Thunder’s chance at winning a title in the future. Perimeter defense – If the Thunder continue with the same issues they had with the Los Angeles Lakers and the Phoenix Suns, then they might be in for a long night against the Rockets. While those other teams had great 3-point shooters and good dribble-penetrators, the Rockets add another wrinkle to that mix: Dwight Howard. None of those teams had the inside presence that the Rockets have. Add to that the fact that our “Dwight-stopper” is currently out with injury, and that could possibly compound the situation. 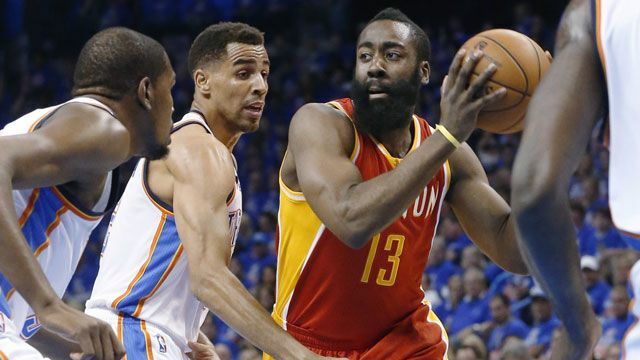 Remember, the Rockets did hang 73 on the Thunder in one half in their last game. In that half, they made 11 three-pointers (8 in the 2nd quarter). 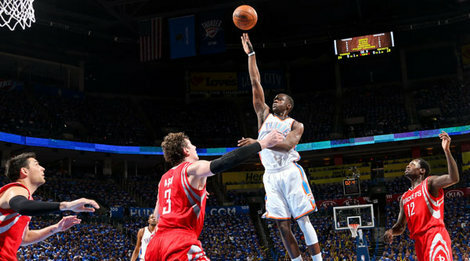 That 2nd quarter was very reminiscent to what happened to the Thunder in the last two 3rd quarters. In those 3 quarters, the Thunder gave up an average of 39 points, which can be a back breaker that can be very difficult to come back from. The good news from that last Rockets’ game was what happened in the 2nd half. 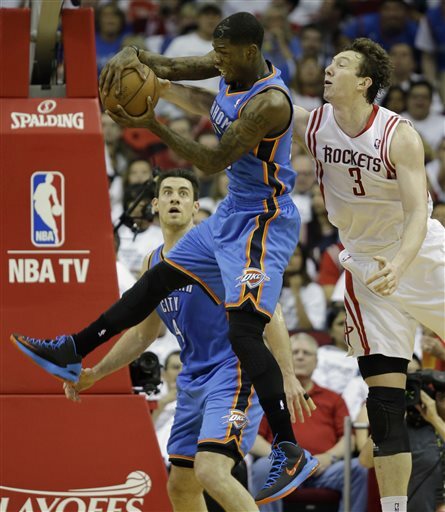 The Thunder buckled down on defense and allowed the Rockets to score only 19 points for the entire 2nd half. They will need to find some sort of middle ground to balance themselves out. This team is no longer playing for each other. Too many guys have different agendas. Too many are doing their own thing. Too many are playing for the wrong reasons. 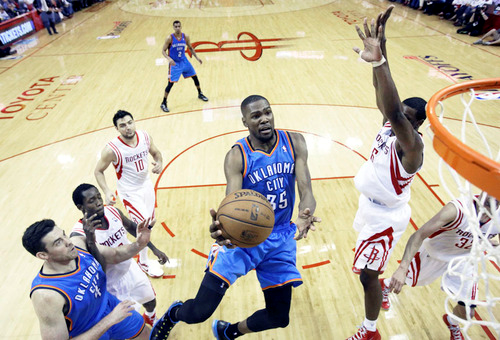 Kevin Durant is gunning for his first most valuable player award. Reggie Jackson is playing for a lucrative extension this summer.Russell Westbrook is working himself back into shape. 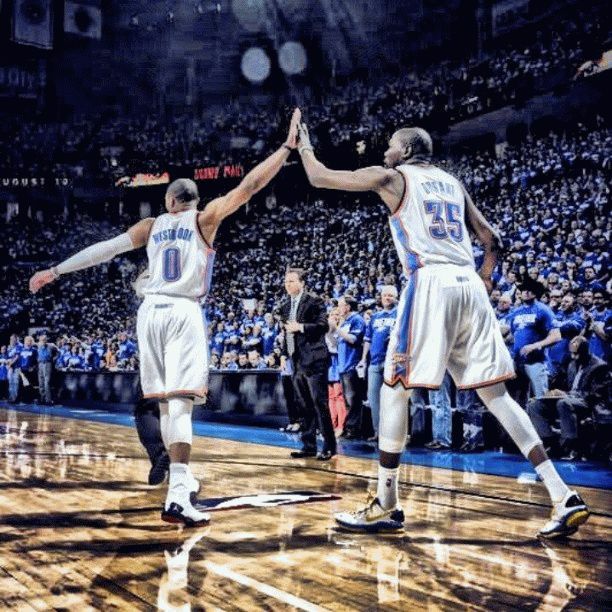 It’s selfish basketball, the kind we’ve rarely seen take shape in OKC. It doesn’t define all 48 minutes. But it’s seen in stretches. Far too many of them. In addition, interviews in the last couple of days with Nick Collison and Derek Fisher, two of the elder statesmen of the team, don’t exactly ooze with words of team chemistry and kumbaya. This could just simply be a bump in the road or it could be more. It will be very interesting to see how the team responds tonight as they play one of their chief rivals in the conference. James Harden – He’s coming to town once again. Nuff said. 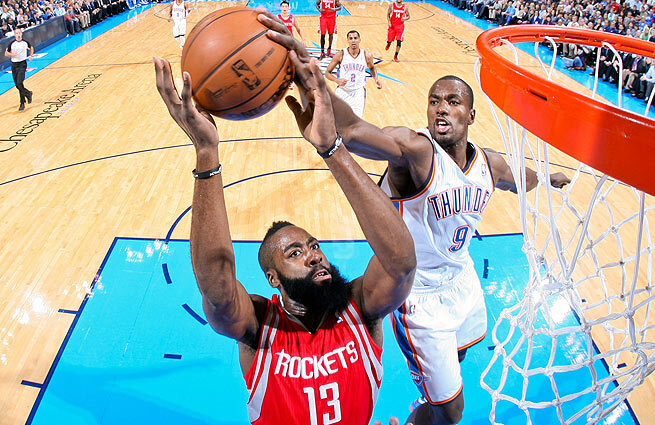 Turnovers – Houston is a team that feasts on turnovers. They have an extremely athletic team that can turn and run on a dime. They usually have 3 capable ball handlers on the floor at all times. If the Thunder can limit the turnovers, then it’ll limit the opportunities the Rockets have on the offensive end of the floor. 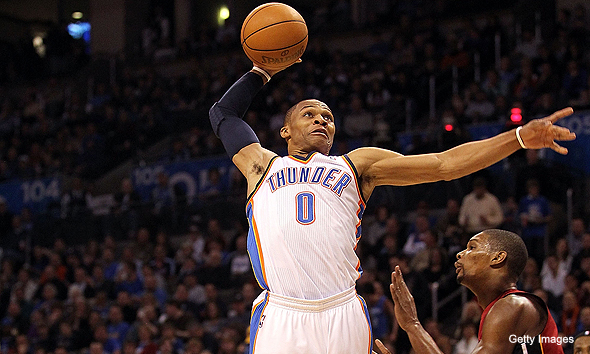 Defending the paint – In the last 2 games, the Thunder have given up 92 points in the paint! Also, the Suns and Lakers combined to take 69 free throws. Add those two things up and what does it equal??? Crappy defense. The perimeter players are playing the vaunted Ole’ defense, while the post players are either too slow on their rotations or hacking the drivers to send them to the line. Stopping Runs – The Thunder’s defense the last two games hasn’t necessarily been horrible for the full 48 minutes. Where they’ve suffered has been in stopping runs, especially when a team/player gets hot from the perimeter. Houston has a handful of players that can get scorching hot from the perimeter. Sometimes, in difficult times, people turn to music to help ease their struggles. Just jump in the car or slip the headphones on, and let Pandora, Spotify, or whatever you use take you to where you really want to go. That’s how I find myself relating to Russell Westbrook’s latest setback. On December 27th, the Oklahoma City Thunder sent out a press release advising that Russell Westbrook had undergone arthroscopic surgery on his right knee and would be out until after the All Star break. The press release stated that while Westbrook had not been experiencing any lingering pain in his knee, there had been some acute swelling that had occurred as of late. The team performed an MRI which showed an area of concern and decided to do the arthroscopic surgery. Those are the current facts the Thunder organization is letting out. In this song, Jay-Z raps about how he and a cohort got into the drug trade together, but things quickly soured when his friend got picked up by the police. While the premise of the song (drug trafficking, snitching, police involvement, etc) holds no water to the Thunder and their players, hopefully, the chorus is a different story. It was all good just a week ago. In fact, it’s been all great for the past 6 weeks. In that span, the Thunder have gone 17-2 and have undoubtedly joined the ranks as one of the top title contenders in the league. It wasn’t that they were just winning games; they were beginning to throttle and dismantle opponents with their aggressive, attacking brand of basketball. And that was all spearheaded by the return of Russell Westbrook in the 3rd game of the season. Now, we’re back to where we were in the beginning of the season. The angst that we are feeling now is the same angst that we should have been feeling for the first 4-6 weeks of the season, which was originally the amount of time Westbrook was supposed to be out when he had his first arthroscopic surgery on October 1st. But he came back about 5 weeks earlier than expected and was playing extremely well as of late. Kevin Durant will never verbally admit it, but he knows that he can’t win a title without a healthy Russell Westbrook. He got a taste of that in the playoffs last season, and will get another swig of that vile flavor for the next 4-6 weeks. As apt as Reggie Jackson has been at handling the starting point guard duties in Westbrook’s absence, he lacks that “it” that drives this team. More specifically, he lacks that “eff you and the horse your rode on” mentality that Westbrook brings to the court that permeates to his teammates through the process of teammate osmosis. Without that, the Thunder are literally a shell of themselves. Now mind you, that shell is better than 75% of the league, but not enough to get the Thunder to the top. We Thunder fans know what we have in front of us. We know, when the team is healthy, we have one of the top 3 teams in the league, without question. But this is going to hurt. In the span that Westbrook is supposed to be out, we are going to face Portland (three times), Houston (twice, DAMN YOU PATRICK BEVERLY), Minnesota (twice), San Antonio (at their place), Golden State, and Miami (probably twice). Can we beat these teams? Of course. But the margin of error goes down to basically zero when we play these opponents. The measuring stick of the next 4-6 weeks may be completely different than the measuring stick heading into the playoffs if Westbrook comes back healthy. For some of us Thunder fans, a 4-6 week coma may be exactly what the doctor ordered. Everyone loves the back-up quarterback in football. Team execs get wooed by 1-2 game performances during a season and try everything to get that back-up quarterback to be their starter. Sometimes it works. And sometimes a back-up quarterback is just a back-up quarterback. It’s no different in the NBA when it comes to back-up point guards. Three years ago, when the young Thunder were first coming up, everyone was looking at Eric Maynor and wondering, “Wow, he could start for half the teams in the league.” In hindsight, though, Maynor was probably nothing more than a product of not only the system, but also of playing next to James Harden. Reggie Jackson recently signed with uber-sport agency CAA in anticipation of his upcoming extension/restricted free agency eligibility. 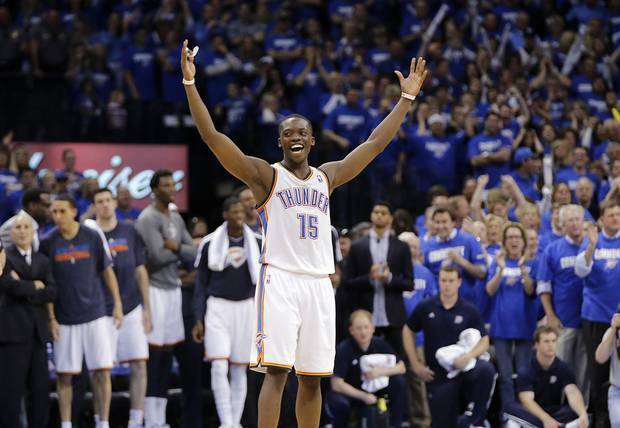 After this season, Reggie Jackson is eligible for an extension from the Thunder. If the Thunder decide to not extend Jackson this offseason, then he enters into restricted free agency in the 2015 offseason, where any team can sign him to an offer sheet and the Thunder have 3 days to match it. The latest example of the “best back-up point guard” getting a lot of love is Eric Bledsoe of the Phoenix Suns. For the three season prior to this one, Bledsoe was Chris Paul’s back-up in Los Angeles and even played a lot with Paul in small ball lineups. His athletic style of play garnered many looks from fans on up to team executives. Since Bledsoe is now starting for the Suns, the next guy on that “best back-up point guard” totem pole is Jackson. Jackson proved his mettle in last season’s playoffs, subbing in for the injured Westbrook, and putting on a Westbrook-lite performance. He has shown some improvement on his mid-range and 3-point shooting and is starting to learn how to manage being a floor general and a scorer. All the media pundits on ESPN, TNT, and NBATV are starting to rave about Jackson and that usually means added exposure. That added exposure usually equates to not only added scrutiny, but also added praise if he continues to perform as he has all season. If Jackson increases his averages during this 4-6 week period, especially against the upcoming competition, he may likely see his bank account skyrocket in the foreseeable future. Bill Simmons and Patrick Beverly. Yeah, laugh it up fellas. We’ll get the last laugh when its all said and done. All three of these songs have different elements of Westbrook’s game and how his knees react to it. If there’s one thing about Westbrook, it’s that he didn’t change his game at all, knees be damned. His first game back he was dunking and flying all over the place. While the timing may have been a bit off and the explosiveness may have gone down by 5%, the game did not change. Westbrook’s only speed is still GO! A mad man on the court that just flies around and revels in the havoc and chaos. 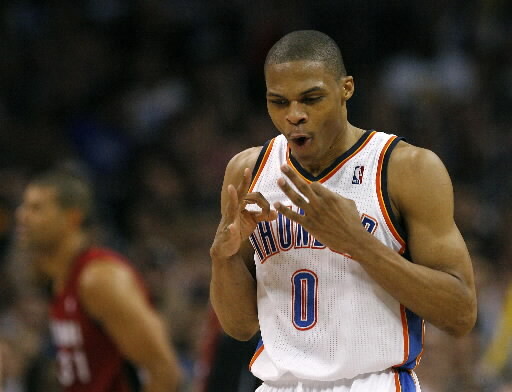 But in the end, is Westbrook’s style of play conducive to his future health? Three surgeries in a little over 8 months. 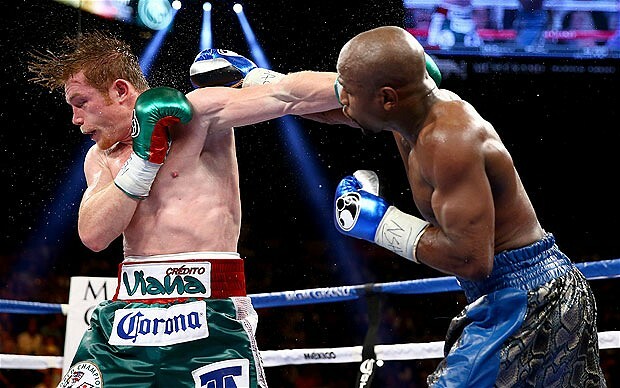 It doesn’t matter if it is a knee or a tooth. If you dig metallic objects into flesh in an invasive fashion three times in an 8 month period, that area is never going to be 100% the same. 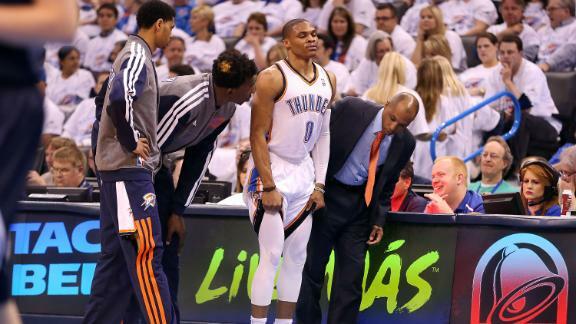 I think the problem with Westbrook was that he rehabbed from the knee injury, but never got the time to recover. He went directly from rehabbing from the meniscus tear to rehabbing from the arthroscopic surgery to playing his brand of basketball. All that contorting and friction on his knees was dangerous before he suffered an injury. But now, after two surgeries, this was almost bound to happen. He never had a chance to recover from all the surgeries. The future ramifications of this is unknown. Athletes have arthroscopic surgeries all the time, but those that rely heavily on athleticism, tend to suffer the most from repeated surgeries. If there’s one man that can buck the trend, though, I hope it’s Westbrook. Denial – I thought it was a joke. I mean, the man played on the injury the entire 2nd half of game 2 and racked up 29 points. One time I ripped a hang nail from my finger and was out of commission for 3 days. You’re telling me this man tore a shock absorber in his knee and was able to play 24 more minutes of playoff basketball successfully? There’s no way he would be needing surgery. Anger – Damn you Patrick Beverly. Yes, the “play on the ball before a timeout” play is one that a lot of players, Westbrook included, make to the tune of a 0.00000001% success rate. But injuries very rarely happen on those plays, especially surgery-requiring injuries. 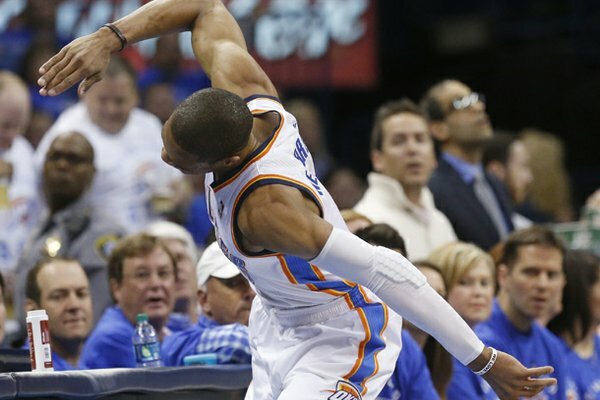 The fact that he completely launched his body into a defenseless Westbrook was reckless and inexcusable. So, again, damn you Patrick Beverly. 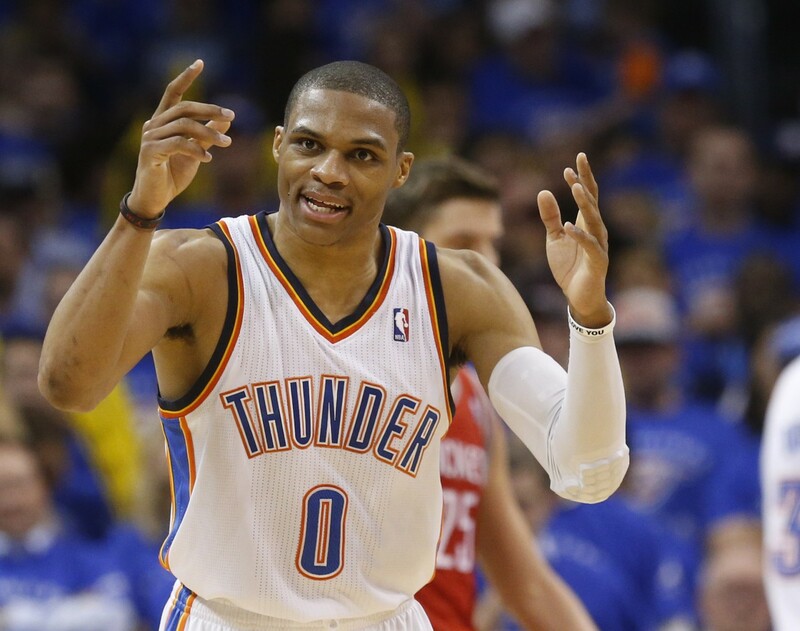 Bargaining – After realizing that this upcoming surgery was not a joke, I started bargaining on Westbrook’s knee. I figured since he played on the injury, it must not be that bad. So, if it wasn’t that serious, maybe he’ll have surgery and come back in 12 days, like Crazy Uncle Ron Ron (Metta World Peace). I figured, at worst, he’d be out for 2-4 weeks. My logic was that if we could somehow push our 2nd round opponent to more than Game 5 or actually make it to the Western Conference Finals, then maybe there was a chance that Westbrook may come back to play for the Thunder this postseason. As you can tell, there was a lot of maybe’s in my bargaining session. Depression – When the news came out after the surgery that Westbrook would be out for the entire playoffs, this was when “basketball fan” depression set in. The Thunder had battled all season long, not only to garner the Number 1 seed in the West, but also to exorcise the demons that remained from the James Harden trade. And now, against Harden and the Houston Rockets in the first round of the playoffs, to have it all disintegrate on a reckless, stupid play, was completely and utterly disheartening. Acceptance – Almost immediately after hearing that Westbrook would be out for the remainder of the playoffs, and after the depression wore off, I accepted that Russell Westbrook would not be walking through those doors in a jersey this season. It was after I accepted this fact that my mindset on this team changed. It was no longer championship or bust. Now it was about getting better and hardening our will for future success. Would I love to see a historic championship run this season? Of course, but the basketball analyst/realist in me knows, that without Westbrook, the mountains that are the San Antonio Spurs and Miami Heat just got a lot higher to overcome. Once I had gone through my stages of grief, I started thinking about some of those sayings and how they apply to this current team. The first one that comes to mind is, “when life gives you lemons, make lemonade.” I’ve always wondered how this team would react to a serious injury to either Kevin Durant or Westbrook. The Thunder have been beyond blessed when it has come to the health of their players, especially the starters. 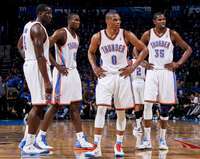 Since March 14th 2011, to include the regular season, the postseason, and the first 2 games of this postseason, the starters for the Thunder have played in 96.8% of those games together. That’s unheard of in the NBA. And none of the injuries have ever been serious. Now, the team is having to regroup on the fly due to an injury to their Iron Man. From a player development standpoint, though, this is not a bad thing. What better way to cut your teeth than in the NBA playoffs? Reggie Jackson has steadily progressed in the last two seasons from a wide eyed rookie using his off arm to protect his dribble in traffic to leader of the bench unit on a championship caliber team. The time he is getting as a starter will have the same effect on his confidence as when Durant, Westbrook, and Harden all played in the Olympics. The “knowing that you belong” aspect of professional sports is often overlooked, but is very important in a young player’s maturation process. Moving Jackson over to starting point guard also opens up a spot in the rotation for another bench player. Playing against a team that relies heavily on small ball lineups, pick-n-rolls, and 3-point shooting, DeAndre Liggins has done his job extremely well in his allotted minutes. Used mainly as a perimeter defender, Liggins has averaged 10 minutes per game and is a +11 combined in the two games since Westbrook’s injury. He’s disrupted the Rockets’ rhythm on PnR’s, has jumped out on the shooters, and has been surprisingly good on the defensive boards. This real time experience in the playoffs can do wonders for a player’s confidence moving forward. As the team (hopefully) moves ahead in these playoffs, it will be interesting to see whether any of the other young, seldom used bench players (Jeremy Lamb, Perry Jones III, Daniel Orton) will contribute any meaningful minutes. 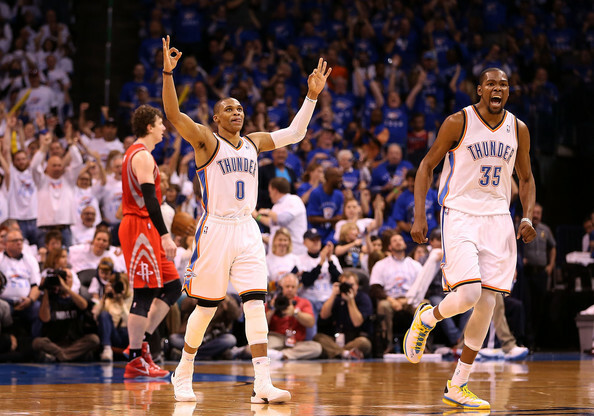 The “next man up” motto holds very true for the Thunder in these playoffs. As the Thunder continue battling in the playoffs, another saying comes to mind: A journey of a thousand miles begins with a single step. Just because one of your best players goes down, doesn’t mean that you stop playing. Look at the Golden State Warriors. David Lee goes down with a torn hip flexor in game 1 of their series against the Denver Nuggets and the team (especially Steph Curry and Jarrett Jack) responds to give them a commanding 3-1 series lead. Kevin Durant knows what’s ahead of him. He knows that from now on he will be Option A, B, and sometimes C for the Thunder. He knows that defenses will key on him with not only their best perimeter defender, but also with a 2nd and, possibly, 3rd defender. He knows this, and he’s ready. Players like Durant train for this moment their entire lives. There was a time, six years ago, when Durant couldn’t even bench press 185 pounds. Now, he’s ready to carry, not just a team, but an entire city on his back. The last quote that comes to mind when I think of this Westbrook situation is, “after the storm, comes the calm.” The storm was the Westbrook injury and the chaos that ensued. But from this experience, I believe the team will be stronger, smarter, and hungrier. Players know that championship windows can close as quickly as they open. A snap of a ligament here, a tweak of a back there, or the stupidity of an over-zealous bench player, and your franchise could be set back a decade. The Thunder now know this. They won’t forget the fragility of championship opportunities. Though the expectations have been lessened, the excitement has not. It’s a new world out there just waiting to be explored.